Performance warning: Phase rotation of anything other than 0 or 180 degrees is a computationally-intensive process, thus the resulting output volume will be very slow to use. If you find that it is taking too long to do anything with the output volume, we recommend exporting the output volume to dugio format (see Exporting a Volume to DUG I/O) and using that instead. In the Control Panel, open the Volume tab. Select a volume in the tree. Double-click the selected volume or right-click and select Configure 'Volume'. The Configure Volume window will be displayed. At Bulk Shift, type the shift value by which you want to shift your data on the time/depth dimension. In this example, you shift data on the time dimension. A negative value will shift data up, while a positive value will shift data down. At Phase Correction, type the phase rotation angle to rotate the data. Accepted value is between -180° and 180°. Note: You cannot apply phase rotation on a depth volume. 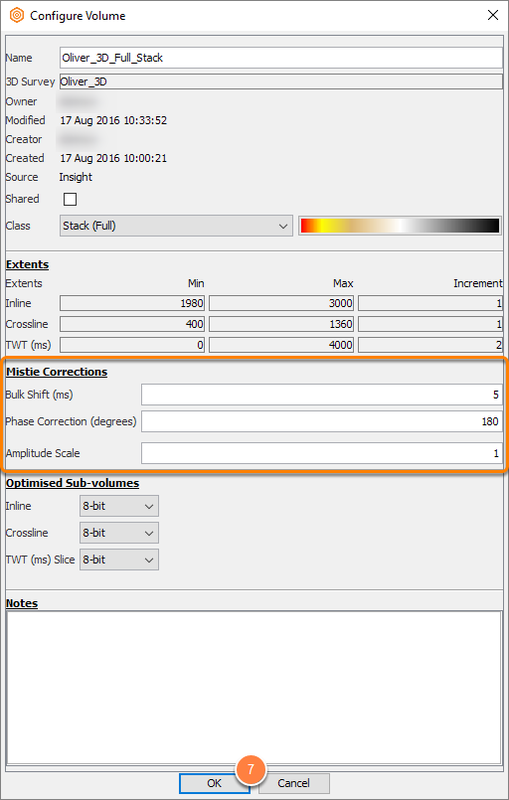 However, you can do so by first converting the volume to time (TWT) domain using the Volume Resampling process or exporting the volume to time domain as described in Exporting a Volume to DUG I/O. At Amplitude Scale, type the amplitude scale to correct the amplitude of the line or volume. Click OK to apply the mistie corrections. As you apply the mistie correction, you can view the changes directly from the 3D View. Mistie corrections are directly saved in dugio metadata. Write access to the volume data is required. If the Unable to Save error message appears for you, change the permission settings to the volume data and click Retry Saving to save the mistie corrections to dugio metadata. Alternatively, click Cancel to abort the mistie corrections.